Notice – the following article contains images some people may find distressing. Following an Indonesian military and police raid on Wananpompi village on Yapen Island in West Papua, shocking details have emerged of a massacre of West Papuan villagers. 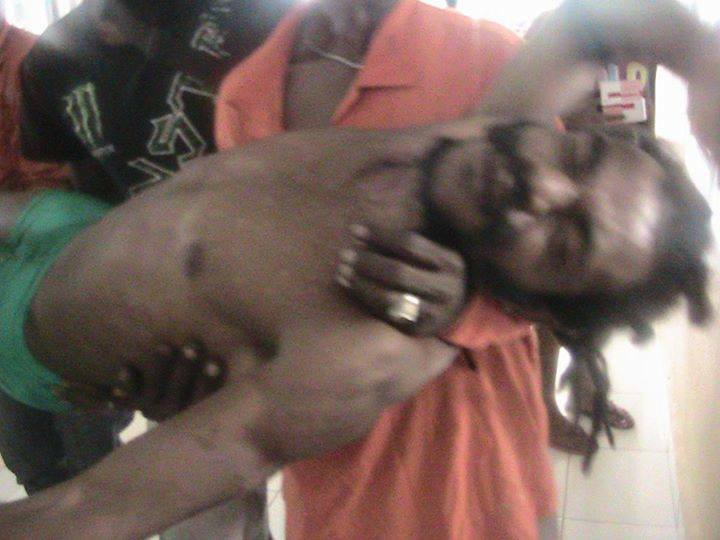 According to the human rights organisation Tapol, as well as the West Papua National Committee (KNPB), 2 West Papuan people were shot dead, 2 more tortured to death and 8 others seriously injured. 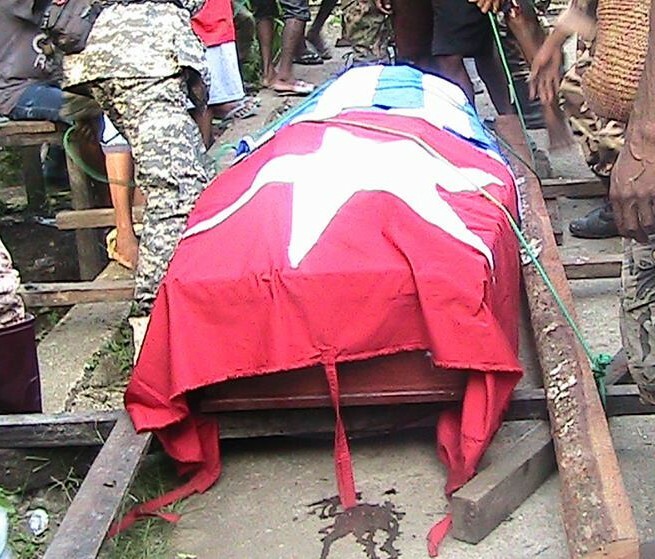 The villagers were peacefully commemorating the 54th Anniversary of West Papua National Day and the West Papuan flag was raised followed by a prayer service. Suddenly, the Indonesian military and police arrived and opened fire upon the villagers, shooting 12 people. A human rights report by the KNPB has detailed the names of the victims as well as the horrific injuries they suffered from the attack. of this sadistic torture, he died later in a police truck. Julian Robaha (50 years old) was shot at 06:27 in both knees and then taken to the police truck to be tortured. Both his legs were cut off and his belly was torn open. He also died in the truck from the horrific torture. Yonas Manitori (38 years old) is the elder brother of Herman Erik Manitori. He was shot at 06:28, in the abdomen and chest and died. Darius Anderbi (45 years old) was also shot at 06:28 and died from his injuries. Agus Manitori (23 years old) was shot in the left leg while trying to help Herman Erik Manitori. He was then shot again in the left thigh and the right ankle as he was about to flee into the forest. He fell beside Herman who told him to leave and flee into the forest. When he was running into the forest, he was shot in his upper left arm and in the stomach. He was seriously injured but reportedly only received medical care later and the care he recieved was not adequate. Yance Manitori (26 years old) was shot in the left ankle and right as well as in the left knee while trying to help Agus Manitori and other victims. Apparently he also did not receive adequate medical care. Paulinus Wororowai (26 years old) was shot in his torso, resulting in a broken rib cage and another bullet lodged in his body. 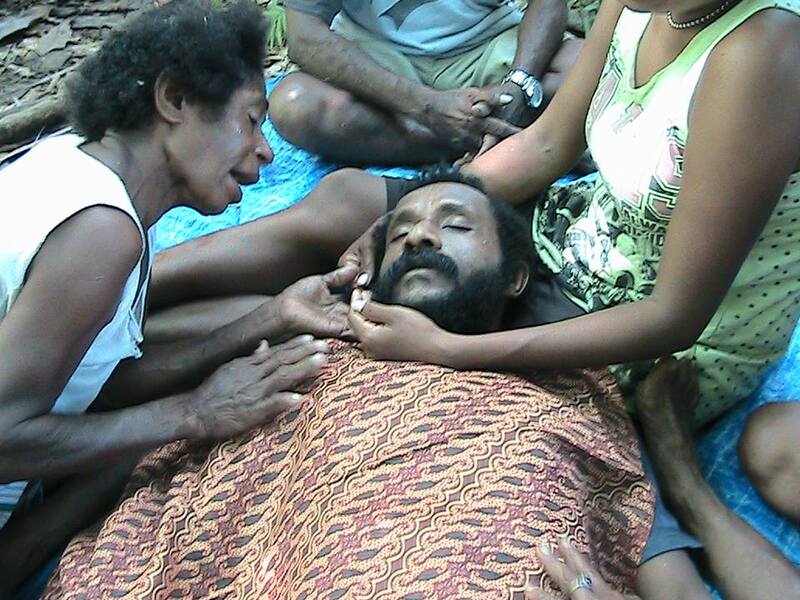 He was left in critical condition and was sent to Biak Island for medical treatment. 8. Anton Toni Runaweri (43 years old) was shot in the side of his neck, penetrating his jaw and mouth, fracturing his jaw and leaving him unable to eat. He is in critical condition and is being referred to Surabaya to get serious medical treatment. 9. Sakarias Torobi (35 years old) was shot in the left leg leaving his leg bone shattered and broken and another bullet lodged in. On 6th December, he received surgery in Biak. 10. Alius Karimati Alius Karimati (45 years old) was shot through his arm by the Indonesian Police Mobile Brigade as he was about to run into the forest. He screamed in pain but was not referred to Biak for treatment. 11. Daud Luther Ayomi (53 years old) was shot in the arm and shoulder. His arm was broken and a bullet was lodged deep into his shoulder. He was sent to Biak hospital for medical treatment of his serious injuries. 12. Pilemon Ayomi (49 years old) was shot in the arm leaving his bones broken. He was also sent to Biak hospital for his serious injuries. The Free West Papua Campaign fully condemn this heinous massacre of West Papuan villagers just for raising the West Papuan flag. 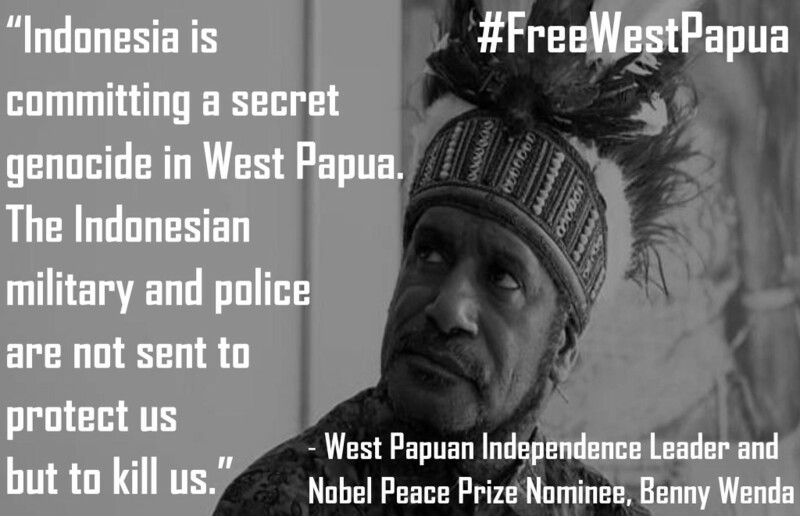 West Papuan Independence Leader and Spokesperson for the United Liberation Movement for West Papua (ULMWP), Benny Wenda also fully condemned the brutal massacre. He said. “It breaks my heart every time I hear such news of yet another human rights atrocity committed by the Indonesian authorities against my people. How can the raising of a national flag justify the shooting and killing of innocent people? “Therefore on behalf of my people, I call upon the Melanesian Spearhead Group, the Pacific Islands Forum and all relevant bodies to please help to from such a human rights fact-finding mission and to discover and help to stop the ongoing genocide against Melanesian Pacific Islanders to this day.